The thrilling sequel to Sharon Cameron's blockbuster gothic steampunk romance, THE DARK UNWINDING, will captivate readers anew with mystery and intrigue aplenty. When Katharine Tulman wakes in the middle of the night and accidentally foils a kidnapping attempt on her uncle, she realizes Stranwyne Keep is no longer safe for Uncle Tully and his genius inventions. She flees to Paris, where she hopes to remain undetected and also find the mysterious and handsome Lane, who is suspected to be dead. But the search for Lane is not easy, and Katharine soon finds herself embroiled in a labyrinth of political intrigue. And with unexpected enemies and allies at every turn, Katharine will have to figure out whom she can trust--if anyone--to protect her uncle from danger once and for all. Filled with deadly twists, whispering romance, and heart-stopping suspense, this sequel to THE DARK UNWINDING whisks readers off on another thrilling adventure. I haven't done this in a while, but this is a very special book. It's the sequel to The Dark Unwinding, the first ARC I got approved for from Scholastic and also one of the best books I've read all year. Seriously. Read my review. If you're a fan of Jane Austen, history, steampunk, or good old fashioned romance (I crack myself up), then why haven't you read this book yet!? The writing is phenomenal, the plot is fast-paced, the love interest is sweet and slow building, there is NO (I repeat: not a single) love triangle, and Katharine herself is smart and admirable. 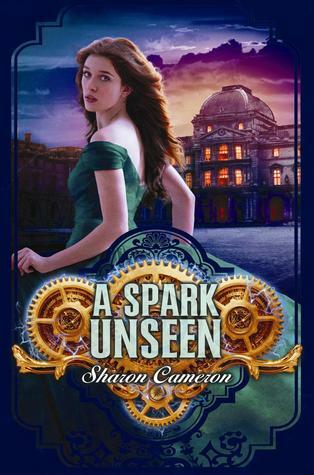 I'm dying to read A Spark Unseen. If I can't get a hold of an ARC, I'm just going to have to live on excerpts and the reviews of luckier people until my pre-order comes. Oh, great pick! I loved The Dark Unwinding and I can't wait to see what happens next! Me either! It was such a cliff ending. Love the cover and sounds super interesting!! Come and see what we've got up this week on Harlie's Books. See ya there! Definitely make the time for it. It's really one of the best written young adults I've read in a while. Me too! The first one was fabulous. I can't imagine this won't be just as good. I hope you get a hold of it soon! It's fantastic.